As Thanksgiving approaches, teach your children the importance of showing appreciation for others by helping them send out their very own Thanksgiving cards. 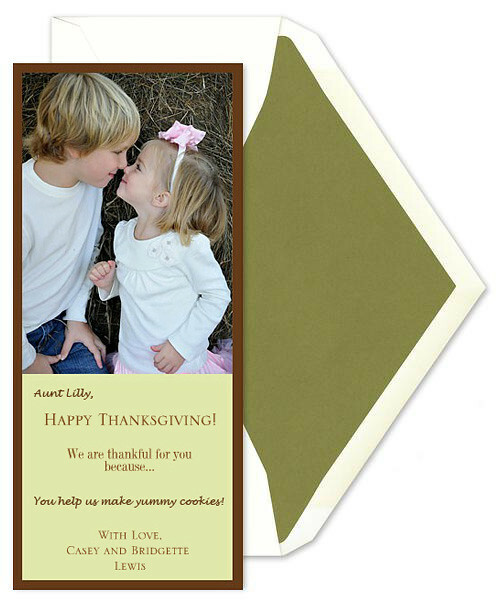 Personalize a photo card with a photograph of your children and the text "Happy Thanksgiving! We are thankful for you because..."
Then, ask your children to think about something positive that they appreciate about the recipient and hand write in their candid responses. You may get some comical answers, but the silliest responses are sometimes the most charming, and friends and relatives are sure to cherish the thoughtful note from your little ones. *Card by Prentiss Douthit available at FineStationery.com.